It's rare that I have cash in my pockets as everything is debit cards here - from a pack of gum to you name it. 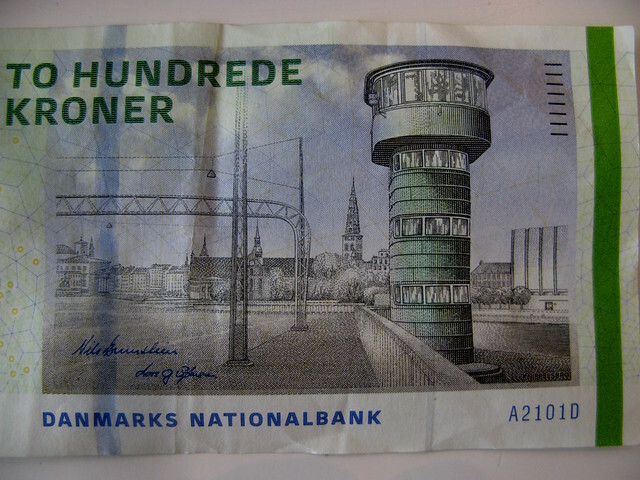 But a had a 200 kroner note the other day and it surprised me to see that it's a new design! That's how rare I see cash. Anyway, it's of Knippels Bridge over the harbour and, right there on the money, is a bike lane. To the left of the sidewalk. It's seperated up to the bridge and on the other side but over the bridge it's a painted line. It's very wide and features about 20,000 cyclists a day.